I don't know why I keep watching remakes, because it seems like I am always disappointed. I suppose I feel that with all the new technology to come along in the past 30 years, these films will only get better once they are enhanced and edited, but the truth is that they are always missing something important, and rarely do justice to the original. The remake of Carrie isn't all that different from the original, just modernized, as Carrie is a loser, who with puberty discovers an amazing power. She tries to hide it, but when pushed, ultimately uses it for evil, it's a classic Stephen King story, that most people already know and there in lies part of the problem. Assuming that most people know the story, a lot of information about Carrie is omitted, leaving the film little to go on. They quickly jump into the story and for a long time have nowhere to go with it. 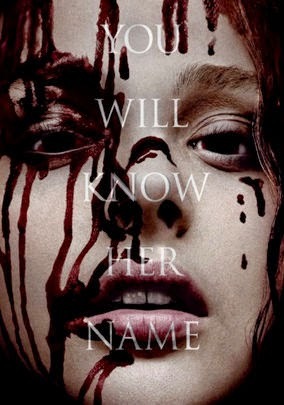 Kick-Asses Chloe Moretz stars as Carrie, and while her performance was outstanding, it is wasted in this film. They really played up the religious angel and Carrie's mother, played poorly by Julianna Moore. Yes, it was creepy and that's what they wanted, but it was so over the top and in your face, that it quickly becomes tiresome. The producers of this film had all the tools to recreate this Horror classic, but fail miserably, as their take on the story was abbreviated and way over the top.